Dress it Black n White ! These pair of Marbe's sandals are embellished with lustrous gold cabochons - each one is hand-applied and galvanized to maintain its color and shine. Made from genuine Greek leather, they are highly finished with a wrap around black fringe. Summer's "it" sandal is here, and we sure can't pick just one! 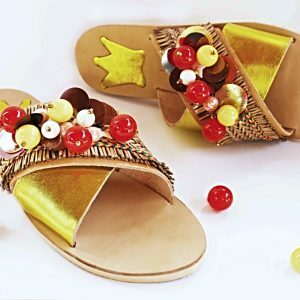 Slip on Marbe new collection and prepare for a day of sunshiny surprises.Embellished with beads and sequins, this jeweled sandal will make you feel like a Queen!!!! Butterflies are an insect of marvelous serenity.A butterfly signifies gracefulness, genuine beauty and whimsy. They follow the wind in dance, moving from flower to flower . Marbe team was inspired to make a sandal with all the beauty of this majestic insect and embellishments .Hope you love the result!!!!! A summer-fresh decorated lace-up genuine leather sandal with high quality anti-slip rubber sole at bottom, it perfectly push out your boho-chic look. Entirely handmade.